Isn't it magnificent? 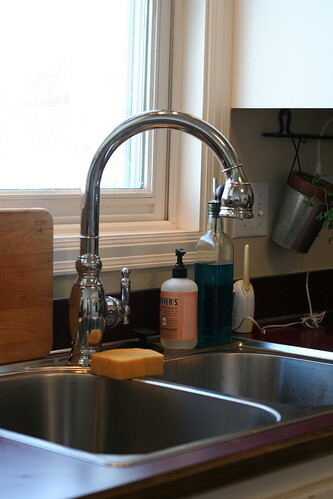 A big, giant new sink and a big, giant new faucet. Wow! OH and I almost forgot one of the best parts, a big new garbage disposal, called The Waste King Gourmet. Move over, Kitchen Master 2000 Salsa Chopper, you've been trumped in kitchen appliance title by the KING of Waste (gourmet). I wonder what the 'gourmet' is for? Does it take my scraps and turn them into garnishes? Does it reject contributions of spaghettios and kraft macaroni and cheese? Does it grind with a French accent? We shall see. But for the moment it is working flawlessly. Thanks SO MUCH to my cousin Kelly for doing all the handywork. He came over after hearing my super loud voice from across the city complaining about how expensive plumbers are. Which now invalidates my rant about how my family consists of a full Geek Squad but no trades people. Oh well. THANKS KELLY! Now, to go swear fealty to my Waste King. Ok -- I'm gonna try this method of reaching you, since I don't think my emails are getting through! Come visit! April is good! Anytime before the 9th or after the 22nd! Sort of narrow, I know, but going into early May is fine, too. Hi -- just in case you didn't find my email in the JUNK, I said that those dates are fine! Book with confidence! Brent, lord of the comcast accounts, finally changed my spam filtering to "off." So now I can get your emails! And we've booked our tickets!! !